Of all the members of the soil food web, earthworms need the least introduction. Most people become familiar with these soft, slimy, invertebrates at a young age. Earthworms are hermaphrodites, meaning that they exhibit both male and female characteristics. They are major decomposers of dead and decomposing organic matter, and derive their nutrition from the bacteria and fungi that grow upon these materials. They fragment organic matter and make major contributions to recycling the nutrients it contains. Earthworms occur in most temperate soils and many tropical soils. They are divided into 23 families, more than 700 genera, and more than 7,000 species. They range from an inch to two yards in length and are found seasonally at all depths in the soil. In ter ms of biomass and overall activity, earthworms dominate the world of soil invertebrates, including arthropods. Figure 1: Earthworms generate tons of casts per acre each year, dramatically altering soil structure. Credit: Clive A. Edwards, The Ohio State University, Columbus. Figure 2: A corn leaf pulled into a night crawler burrow. Credit: Soil and Water Management Research Unit, USDA-Agricultural Research Service, St. Paul, Minnesota. Earthworms dramatically alter soil structure, water movement, nutrient dynamics, and plant growth. They are not essential to all healthy soil systems, but their presence is usually an indicator of a healthy system. Earthworms perform several beneficial functions. Figure 3: A mixture of soil and organic matter within an earthworm burrow. Earthworms incorporate large amounts of organic matter into the soil. Credit: Clive A. Edwards, The Ohio State University, Columbus. Figure 4: Some worms live in permanent vertical burrows such as these. Others move horizontally near the surface, filling their burrow with casts as they move. Credit: North Appalachian Experimental Watershed, USDA-Agricultural Research Service, Coshocton, Ohio. Different species of earthworms inhabit different parts of the soil and have distinct feeding strategies. They can be separated into three major ecological groups based on their feeding and burrowing habits. All three groups are common and important to soil structure. Surface soil and litter species – Epigeic species. These species live in or near surface plant litter. They are typically small and are adapted to the highly variable moisture and temperature conditions at the soil surface. The worms found in compost piles are epigeic and are unlikely to survive in the low organic matter environment of soil. Upper soil species – Endogeic species. Some species move and live in the upper soil strata and feed primarily on soil and associated organic matter (geophages). They do not have permanent burrows, and their temporary channels become filled with cast material as they move through the soil, progressively passing it through their intestines. Deep-burrowing species – Anecic species. These earthworms, which are typified by the “night crawler,” Lumbricus terrestris, inhabit more or less permanent burrow systems that may extend several meters into the soil. They feed mainly on surface litter that they pull into their burrows. They may leave plugs, organic matter, or cast (excreted soil and mineral particles) blocking the mouth of their burrows. It is easy to determine whether you have an adequate population of earthworms in your soil. Look for their casts in the forms of little piles of soil, mineral particles, or organic matter at the soil surface. They can be seen moving over the soil surface or even breeding, particularly on warm, damp nights. Dump a spadeful of moist soil into a bucket or onto a sheet of plastic, and sort through for earthworms. Can you identify different species? To find the deep burrowing species, pour a dilute mustard solution onto the soil. Many will quickly come to the soil surface in response to this irritant. The majority of temperate and many tropical soils support significant earthworm populations. A square yard of cropland in the United States can contain from 50-300 earthworms, or even larger populations in highly organic soils. A similar area of grassland or temperate woodlands will have from 100-500 earthworms. Based on their total biomass, earthworms are the predominant group of soil invertebrates in most soils. The family of earthworms that is most important in enhancing agricultural soil is Lumbricidae, which includes the genuses Lumbricus, Aporrectodea, and several others. Lumbricids originated in Europe and have been transported by human activities to many parts of the world. The United States has only one or two known native species of lumbricids. Others were brought to this country by settlers (probably in potted plants from Europe), and were distributed down the waterways. Generally, lumbricids are much more common in the north and east than in the drier south and west of the United States. They tend to be more abundant in loam and clay loam and even in silty soil, than in sandy soil and heavy clay. Populations also build up in irrigated soil. Earthworm populations tend to increase with soil organic matter levels and decrease with soil disturbances, such as tillage and potentially harmful chemicals. Figure 5: Casts at the soil surface are evidence that earthworms are shredding, mixing, and burying surface residue. Credit: Soil and Water Management Research Unit, USDA-Agricultural Research Service, St. Paul, Minnesota. Figure 6: This earthworm burrow is an opening in an otherwise crusted soil surface. Credit: Clive A. Edwards, The Ohio State University, Columbus. Earthworms also influence other soil-inhabiting invertebrates by changing the amount and distribution of organic matter and microbial populations. There is good evidence that earthworm activity affects the spatial distribution of soil microarthropod communities in the soil. Earthworms have few invertebrate enemies, other than flatworms and a species of parasitic fly. Their main predators are a wide range of birds and mammals that prey upon them at the soil surface. Earthworms improve water infiltration and water holding capacity because their shredding, mixing, and defecating enhances soil structure. In addition, burrows provide quick entry for water into and through soil. High infiltration rates help prevent pollution by minimizing runoff, erosion, and chemical transport to surface waters. There is concern that burrows may increase the transport of pollutants, such as nitrates or pesticides, into groundwater. However, the movement of potential pollutants through soil is not a straightforward process and it is not clear when earthworm activity will or will not have a negative impact on groundwater quality. Whether pollutants reach groundwater depends on a number of factors, including the location of pollutants on the surface or within soil, the quantity and intensity of rain, how well water moves into and through other parts of the soil, and characteristics of the burrows. The horizontal burrows of endogeic earthworms (such as Aporrectodea tuberculata, which are common in Midwestern fields) do not transport water and solutes as deeply as the vertical burrows of night crawlers (L. terrestris) and other anecic species. 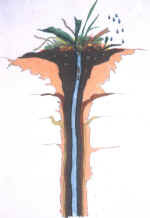 Even vertical burrows, however, are not direct channels for water movement. They have bends and turns and are lined with organic matter that adsorbs many potential pollutants from the water. Although there is much more to learn about how earthworms affect water movement through soil, they clearly help minimize pollution of surface waters by improving infiltration rates and decreasing runoff. Figure 7: A mound of organic matter was moved aside to expose the entrance to a burrow. L. terrestris will quickly replug its burrow if its mound is removed. Credit: North Appalachian Experimental Watershed, USDA-Agricultural Research Service, Coshocton, Ohio. Figure 8: L. terrestris mating, and earthworm cocoons. Earthworms mate periodically throughout the year, except when environmental conditions are unfavorable. The worms form slime tubes to help adhere to each other during copulation which may take as long as an hour. After the worms separate, they each produce a cocoon. One or two worms will hatch from a cocoon after several weeks. L. terrestris cocoons are about a quarter inch long. The substitution of conventional tillage by no-till or conservation tillage is increasingly common and widely adopted in the United States and elsewhere. In these situations, earthworms, particularly the “night crawler,” Lumbricus terrestris L., are especially important. Earthworms become the main agent for incorporating crop residue into the soil by pulling some into their burrows and by slowly burying the remainder under casts laid on the soil surface. In reduced tillage systems, surface residue builds up and triggers growth in earthworm populations. Earthworms need the food and habitat provided by surface residue, and they eat the fungi that become more common in no-till soils. As earthworm populations increase, they pull more and more residue into their burrows, helping to mix organic matter into the soil, improving soil structure and water infiltration.